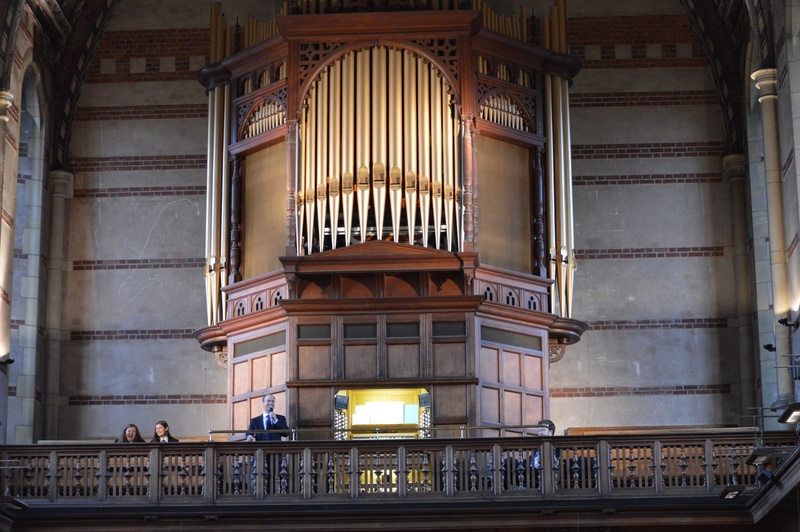 Last week, our Director of Music, Timothy Uglow held an organ recital in our magnificent College Chapel. Resident Trainee Teacher, Mr. Harry Jacques gives us a review of the evening. “On Wednesday 6 June, Director of Music, Timothy Uglow put the chapel organ through its paces, leading the audience through a diverse array of pieces. Beginning with repertoire from British choral tradition with guest pupil singers, followed by an effective realisation of a well-known TV theme and finally a transcendent experience of the French organ tradition, with pieces able to instil quiet and calm reflection before stirring the senses with awe-inspiring symphonic majesty. The recital opened with ‘Exultemus’, a movement from Percy Whitlock’s ‘7 sketches on verses from the Psalms’. In true Whitlock style, this piece combined captivating melody with a sense of rhythmic drive and purpose. Uglow’s vivacious performance used the full extent of the organ’s palette, from the shimmering of celestial strings to the brass fanfare from the solo trumpet. The performance of Stanford’s ‘Preludes’ interspersed with ‘Bible Songs’ evoked something of the magic often experienced in the Choral Evensong setting, the lyrical melodies being delivered by Ruby Bak (Year 11) and Emily Zehetmayr (Lower 6th) with great musicality and technical control. Stanford’s organ writing often shows great sympathy to the mechanics of range and employing a number of manuals (keyboards) and pedals. Uglow made the most of these idiomatic textures to bring out a number of melodic lines using a variety of tonal colours. For a moment of lighter relief, the Songs of Praise ‘Toccata’ was always likely to be a crowd-pleaser. Beyond its use for the Sunday afternoon BBC programme, the famous theme is transformed in a number of interesting ways. Despite being a more easily accessible piece, it proved to be just as involved for the organist, moving through complex registration and manual changes. Following the fine exhibition of British repertoire, we moved over the English Channel to the sound of 20th-century composer, Olivier Messiaen. Messiaen famously recorded the sounds of birdsong to imitate in a series of compositional sketches. His organ repertoire is distinguished by the type of scales he used in the composition. ‘Le Banquet Celeste’, one of his best known works, provided a great contrast in the recital, its slow tempo and smooth-changing kaleidoscope of tonal colours bringing the atmosphere of the concert to a state of complete tranquillity. The evening’s music concluded with Guilmant’s ‘Sonata No.1 in D minor, Op.42’. Guilmant, along with Franck and Widor, composed repertoire for a new wave of symphonic organs being built in France from the mid-19th century. Guilmant pays homage to the compositional styles of Baroque and Classical era composers in this piece, opening in a grandiose French overture style. In the pastoral-themed middle movement, Uglow showcased the beautiful tones of the oboe and flutes of the organ.